Some governors opposed to what they call a "bailout mentality"
(CNN) -- Plagued by rising unemployment, falling tax revenue and increased demand for state services, the nation's governors met with President-elect Barack Obama and Vice President-elect Joe Biden on Tuesday to press for federal money to ease their fiscal strain. President-elect Barack Obama shakes hands with California Gov. 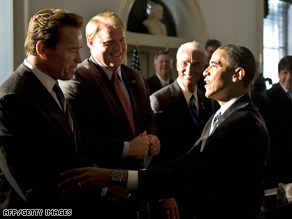 Arnold Schwarzenegger on Tuesday. Obama and Biden told those at the National Governors Association meeting that the federal government needs to build a deeper relationship with the governors in order to put America on the path to long-term prosperity. "Change is not going to come from Washington alone," Obama said. "It's going to come from all of you. It will come from a White House and statehouses all across the country that are working together, and that's the kind of partnership I that I intend to forge as president of the United States," Obama said at the conference in Philadelphia, Pennsylvania. "I hope that this is the beginning of laying that foundation." "If we're listening to the governors, then the money that we spend is going to be well spent, and it means that it's going to get working faster and the people in your states are going to experience prosperity sooner," Obama said. The national governors' meeting comes a day after the National Bureau of Economic Research officially declared the United States' economy to be in a recession. The governors are asking the president-elect for federal money to help them get their states back on track. Obama and congressional Democrats have pledged to pass an economic stimulus package when Obama takes office in January. House Democrats said Monday that they will push for an economic recovery package of up to $500 billion. The governors want about $136 billion to use for what they call "ready-to-go projects," like water and sewer projects or building roads and bridges. They want another $40 billion to go toward Medicaid programs. Pennsylvania Gov. Ed Rendell, who is chairman of the National Governors Association, says that for every $1 billion the states get from the federal government, the governors believe they can create 40,000 jobs. "This is the best way to recharge the American economy," Rendell said Tuesday on CNN's "American Morning." Rendell said the governors are going to ask for a strong commitment to infrastructure repair, including bridges, roads, highways and schools. He said he hopes the federal government will also help the states with their Medicaid burden. "When the economy is bad, the social service demands grow. When the economy is bad, people lose health care. And that means many of them come to the Medicaid system. And we need help in sharing that burden," he said at a news conference Monday. "By no means are we looking to the federal government to relieve us of that responsibility. We know first and foremost it's our responsibility. But we do need some help." But not all governors support turning to the federal government for help. In an op-ed in The Wall Street Journal, Republican governors Mark Sanford of South Carolina and Rick Perry of Texas urged governors "from both sides of the political aisle to join with us in opposing further federal bailout intervention." "The federal government is not only burying future generations under mountains of debt. It is also taking our country in a very dangerous direction -- toward a 'bailout mentality' where we look to government rather than ourselves for solutions," they wrote. Rendell, however, disputed the notion that governors are after a bailout. "Investing in the country's infrastructure, investing in renewable energy -- those aren't bailouts. These are things that actually produce jobs, unlike the bailouts that we've seen of Wall Street and of the banks, that don't produce one new job," he said. "We're not coming to the president-elect and saying 'Help us' without having taken steps to help ourselves," he said. CNN's Suzanne Malveaux and Kristi Keck contributed to this report.